Gabriel is getting used to being responsible for his two sons in this story. He has been out of it for a bit and is desperately trying to be a capable and good father to these two boys. 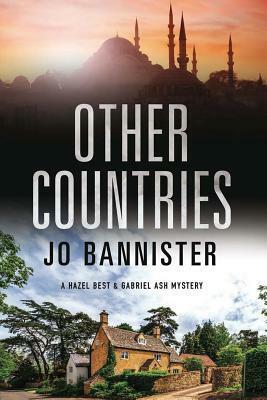 Detective Constable Hazel Best’s latest assignment takes an unexpected turn in the compelling new Gabriel Ash mystery. Returning to work after an extended leave of absence, DC Hazel Best’s first task is to shadow TV historian Oliver Ford, who has arrived in Norbold to open a new museum. What should have been a routine assignment takes a decidedly dramatic turn however when Hazel saves Ford from a murderous attack that would appear to be an act of jihad. But why would someone fly thousands of miles to firebomb an obscure little museum in a quiet English village? Hazel can’t help thinking there’s more to this case than meets the eye. Meanwhile, Hazel’s friend Gabriel Ash and her lodger Saturday are growing increasingly uneasy at Hazel’s developing relationship with Oliver Ford. Though neither of them can guess the real danger that Hazel – and not only Hazel – faces, nor the direction from which it comes. Along with Patience ( my favorite character ) he is gradually moving forward and now must add to his worry list his best friend Hazel. Hazel is just now coming back to police work after a forced leave. When she is assigned to guard a celebrity in town to film at the museum, Hazel gets in way over her head. You just know it is going to be interesting. Underlying all of the interaction of the characters is a theme of abuse. Emotional, physical and sexual. And why it is not reported as much as it should be. All of the characters have distinct personalities but they gel really well together in this mystery!